Home Uncategorized How often should you get a massage? This is a question I get quite often and it all depends on a variety of different things. If you see a massage therapist once a year you will feel quite relaxed at the end of the session. But your tension may soon return. I frequently tell my clients, your tight muscles were not formed in one day so the tension may not go away with a single visit to my office. It will generally take a few visits to return to a normal state. Most people typically won’t get a massage until they have some form of pain or discomfort. For a client dealing with tension or chronic pain I would suggest weekly visits until one could notice consistent relief from pain and stress. Bi-weekly or even monthly maintenance visits would be in order after that. Waiting a year between massages would quickly put your body back into a state of dysfunction and may require several sessions to get back on track. For athletes who use their muscles more aggressively than the rest of us regular massage may be called for. Especially, if they perform regularly in in competitions. Consistent massage elongates tight muscles and improves flexibility. Athletes who wish to attain peak performance from their bodies would benefit from a regime of deep tissue work and sports massage. Please note that after a deep tissue massage it takes about 48 hours for the body to re-balance itself. And it’s not suggested to get deep tissue work with less than 48 hours of a competition. For many a relaxing massage to reduce general stress and tension is just what is called for. Ideally, monthly (maintenance) visits with a massage therapist is the best to keep the body balanced. One could get a therapeutic massage every day. But that’s expensive and not practical for most people. I do provide massage packages which can help reduce the cost of multiple treatments. Point work is another popular option on a limited budget. These are typically 30-45 minute sessions that focus on specific problem areas. 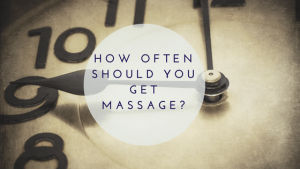 So how often should one schedule a massage? As you have read, many things need to be considered. But if you are still not sure please feel free to contact me to find the right fit for you.